FRANKFORT, KY. — Tea party activist David Adams has filed a lawsuit challenging the long-standing practice of providing incentives to companies that locate or expand in Kentucky. Adams claims in the lawsuit filed Wednesday in Franklin County Circuit Court that providing such incentives is unconstitutional. He is asking that the practice be stopped. Kentucky has a long history of luring companies in with a variety of incentives that have been credited with helping the state land a variety of manufacturing plants. Adams has filed a couple of other lawsuits in recent weeks challenging other state government initiatives, including the creation of the Kentucky Health Benefit Exchange. That agency, ordered set up by Gov. 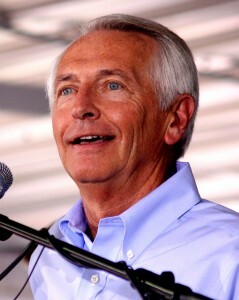 Steve Beshear, is intended to help the uninsured find medical coverage. It is fundamentally the duty of the court system to decide disputes over whether government officials have exceeded their statutory and constitutional powers. That’s pretty bold language, and it appears to open the door to many more suits like the most recent challenge to the troubling system state subsidies for favored companies and industries. I, for one, can’t wait to see how these kinds of challenges go forward. Having spent time studying the General Assembly, I have a few thoughts about fertile ground for future suits. Next month, the Obama Administration will begin granting waivers to states that are not on track to meet proficiency requirements in the No Child Left Behind Act. Education Secretary Arne Duncan will be granting these waivers selectively, based mostly on states’ willingness to abide by new executive branch mandates not included in NCLB, likely including adopting national curriculum standards. Duncan has the authority under NCLB to grant waivers, but not to compel states to jump through administration hoops in order to earn them, as Neal McCluskey has documented clearly. We’ve broken any semblance of a Constitutional balance of power between the executive and the legislative branch. Now the President is just going to dictate to every school what they’re going to teach. And that is a giant threat to freedom and to the American education system. A broader recognition that the Constitution grants neither Congress nor the President any role in education would go a long way toward fixing these problems. NCLB may be, to quote Arne Duncan, “a slow-motion train wreck,” but using that law to transfer power away from parents, states and Congress is easily a solution worse than the problem. Without the Census, How Would We Plan? If we don’t know how many kids there are, how do we know how many classrooms we need? The Census helps us know exactly what we need, so everyone can get their fair share of funding. We can’t move forward until you mail it back. First of all, helping the feds apportion education funding is not the purpose of the Census. A decennial enumeration of persons in the U.S. is in the Constitution; federalized education funding is not. But that’s not even the weird thing about the ad. Marge: Homer, we have a perfectly good bookcase. Homer: Yeah, but this is what they’re doing on campus. Besides, it isn’t costing us: I swiped the cinder blocks from a construction site. Worker: Sir, six cinder blocks are missing. Boss: There’ll be no hospital, then. I’ll tell the children. Why is that auto manufacturers, homebuilders, retailers, food producers, clothing producers and others who must compete for customers are somehow able to not only plan for changes in population, but also plan for the customers who may or may not voluntarily choose to patronize them? Those companies are in turn serviced by the firms and people that somehow manage to supply just the right amount of steel, lumber, labor, food, textiles and everything else to provide for often competing needs. I realize that the Census can help all these actors at one point or another, but that count tells us precious little about the dynamic preferences of hundreds of millions of people, preferences that are readily accommodated in the marketplace. Why is a once-a-decade count of people so critical for school planning? Shouldn’t it be easier for public schools to plan for a relatively captive group of “customers”? Beyond that, even if school administrators had perfect information about demographics and the desires of parents and were fully empowered to act on them, would they be more accommodating? I know Mr. Obama taught constitutional law at one point, but I think even he would be hard pressed to show me where the federal government gets the authority to do any of those things. States, sure. But the feds? Yet another reason to stay in school, kids. You don’t want future presidents like this to try to convince you that they have more authority than they actually do, do you? What will a president who comes here in twenty or fifty or one hundred years say about what all of you did for this country? Considering I’ll never run for public office, there’s not much chance my name will end up on a bridge, federal building, dam, highway, overpass or parking meter. Still, I’d like a future president to come along, use me as an example of cynicism and say that I was an obstructionist and an opponent of progress/hope/change. That might be nice for my grandkids to hear.